Whether it’s lighting, cleaning or temperature control, there are lots of ways to start automating your home and connecting the devices you use most frequently. 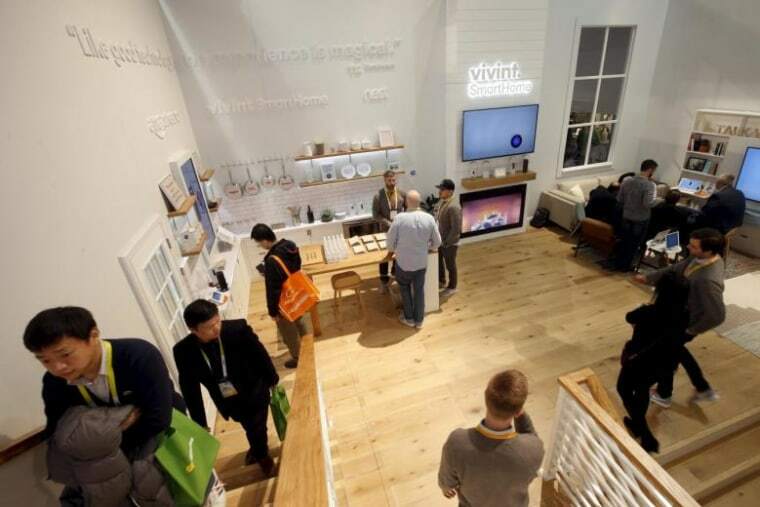 And, while the reality of a truly “smart home” is still a few years off as standards are worked out, more and more companies are integrating technologies like Apple HomeKit and Amazon Echo, making it easier than ever to add some smarts to your devices. Here are our top smart devices to help turn any home into a smarter home. Getting strong, fast Wi-Fi everywhere in the house is the basis of any well-functioning smart home. If the Wi-Fi can’t reach your upstairs guest room or the garage, then your smart devices won't work too well. eero is a system of connected routers that use mesh technology to distribute the bandwidth evenly throughout your home. How many you use depends on the size of your house but eero recommends one router for every 1,000 square feet. So, if your home is over 2,000 square feet, you might consider buying the three-pack, especially if there are lots of walls that the signal has to get through. Whether it’s arms full of groceries or moving boxes, we’ve all stood at the front door fumbling to find keys in the dark with one hand. For the ultimate in convenience, get a smart lock. Kevo’s Touch-to-Open Smart Lock unlocks your front door lock with the tap of a finger, communicating via Bluetooth with your phone. With the Kevo app you can even send an eKey to a relative or house guest. Kevo replaces the entire deadbolt, but if you don’t own your home or just don’t want to replace what’s already there, the August Smart Lock installs on the inside of the front door right over your existing lock. It offers the same hands-free entry and guest access as Kevo and integrates with Apple HomeKit so Siri can do the unlocking for you. The Ring Video Doorbell lets you answer your door from your phone, seeing and speaking to whoever is at the door. We’re not so lazy (yet) that we can’t get up and answer the front door when the doorbell rings, but what if you’re not home and you’re expecting an important package? The Ring Video Doorbell lets you answer your door from your phone, seeing and speaking to whoever is at the door. Not to worry, the video is only one way; you can see them but they can’t see you, so if you’re just getting out of the shower, you can have a 2-way conversation and ask the delivery person to leave the package on the porch. Ring also records video on motion so even if you miss a doorbell ring, you can go back and play it later. Motion alerts send a notification when movement is triggered or you can access a live view of the front door at any time. Yes, you will always know when your significant other has ordered pizza for dinner. Having a security camera in the home provides total peace of mind. Canary’s smart home security camera lets you keep an eye on things while you're away on vacation, and let you check up on your cats while you're at work. Canary sends motion-activated alerts to your phone, records in HD video, and has a siren built into the app so if you see something amiss, you can trigger the alarm and call the cops. Timeline videos stored in the cloud can be accessed from anywhere using the app which is how you can know for sure which cat knocked over that vase. If you’re looking for an outdoor security camera, Canary Flex is weatherproof and wire-free and will be out later this year. Netatmo’s Presence, also launching in November, turns on a smart floodlight and sends alerts to your phone when it detects motion. The easiest way to control your smart devices is by using your voice, and the simplest way to do that is through Amazon’s Alexa, the virtual assistant built into the Amazon Echo. The Echo, which doubles as a Bluetooth speaker, is somewhat pricey and not something to put in every room — but Amazon just released the new, lower-priced Echo Dot, which is basically the Echo minus the speaker portion. At less than a third of the price of the Echo, the Dot can connect to a Bluetooth speaker to play voice-controlled music from Amazon Music, Spotify, Pandora and more, plus it has an audio-out port. The most impressive feature, however, is how easy it makes it to connect to and control your lights, ceiling fans, and so many other smart home devices from Philips Hue, Samsung, Nest and more. Adding connected lights to your home is one of the easiest ways to make your home smarter. Lutron’s Caseta Wireless Dimmers work with many types of bulbs, making them both dimmable and smarter. It’s easiest to begin with a starter kit, which comes with a Wi-Fi enabling bridge, light dimmers, and a remote. Set schedules using Lutron’s app or control the lights from your phone at home or on the road. If you use Lutron’s shades as well, they can all be controlled using the same app so you can set your lights to turn on at sunset, while also lowering the shades. The lights integrate with Apple HomeKit or Amazon Echo so you can ask Alexa, while you’re in bed, to turn off the living room lights. Zzzzz. If you just want to make a few hard-to-reach lamps “smart” you can install a smart switch. Lutron’s Caseta Wireless Plug-in lamp dimmer plugs into a wall outlet, which you then plug the lamps into. Using the included remote you can turn the lights on, off or dim them to set the mood for a romantic dinner. If you have hard-to-reach windows, consider putting automated shades on them. Lutron’s battery-powered Serena Remote Controlled Shades are Wi-Fi enabled, making it easy to close the shades when the sun starts pouring in or when it’s time for bed. One tap of the remote, which can be mounted on a wall for convenience, opens and closes a single shade or a group you can create. Because they’re Homekit enabled, they work in conjunction with Lutron’s smart lighting, and can even be controlled by simply asking Siri to do it for you. The Honeywell Lyric T5 works with Apple Homekit and Amazon Echo, so you can use your voice to control your thermostat. A smart thermostat helps save energy and money and makes your home just the right temperature for when you arrive. It learns your habits and adjusts itself, whether it’s cranking up the AC or turning up the heat. Honeywell’s line of Wi-Fi thermostats can be controlled from anywhere using the Lyric app, or just by using the touchscreen display. Its latest thermostat, the Lyric T5, works with both Apple Homekit and Amazon Echo, which means you can use your voice to control your thermostat and set menus and schedules in conjunction with other connected devices. When moisture or freezing temperatures are registered, the Honeywell Lyric Wi-Fi Water Leak and Freeze Detector sends an alert to your mobile device. The Haiku L Series Fan is stylish, sleek, and quiet, and can be controlled on a mobile device. Ceiling fans are no longer just functional, they’re Wi-FI connected and smart. The Haiku L Series Fan is stylish, sleek and quiet and, in conjunction with the optional SenseMe package, can be controlled on a mobile device using either the Haiku Home app or through an integration with Amazon Echo. The fan has a dimmable LED dome light which is controlled separately from the fan so the SenseMe technology can be set to turn off the light or fan, or both, when motion is no longer detected in the room. You know that sinking feeling when you come home and see your garage door was accidentally left open, or you’re an hour into vacation and can’t remember if you closed it? That won’t happen if you add just a little smarts to that garage door. Chamberlain’s MyQ Garage Door Controller lets you check the status of your door from anywhere and open or close it remotely. Custom alerts go right to your mobile phone to let you know when the door has been opened. MyQ works with Nest so it can tell the thermostat to switch to Away mode when you leave and works with most brands of garage door openers made after 1993. No one likes to vacuum and mop floors, so why not get a robot that does the dirty work for you? iRobot’s Braava Jet Mopping Robot is for wood floors and has three different modes; dry sweeping, damp sweeping and wet mopping. It can clean and pick up cat hair in places I just can’t get to. The Braava jet uses advanced navigation software and sensors to map out the most efficient route, and is smart enough to steer clear of furniture and obstacles.